Thats the hexagonal brooch i would like to see in the main line..But i doubt Q.Sofia owns the brooch tbh... Time will tell.. I am unclear as to whether JC purchased those jewels with personal funds or crown funds, which would determine if they are his personal property. Does anyone know? 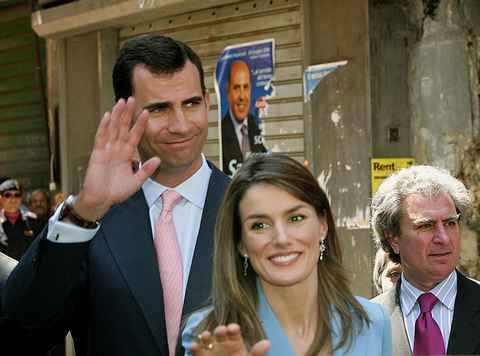 The jewels of the Spanish Royal Family are private and they buy them with private funds. The palaces, royal collections and institutional gifts belong to Patrimonio Nacional, and that is an independent institution managed by the government. If Patrimonio Nacional wanted to buy a historical jewel for the royal collections, that purchase would be public. Some jewels, at least minor ones, will leave the main line upon Sofía's death, that's for sure. I do hope the rubies, the Prussian tiara and at least some important necklaces would go Felipe's ways, otherwise, they would eventually be sold. I don't see their daughters using them that much to begin with. Apparently, K JC bought back some family heirlooms from sisters and other Borbóns. As far as I can remember, QS has always been very fond of jewellery, much more so than Q Letizia ,so I very much doubt KF will follow his father's steps. I wish he would,though. Letizia has seldom use any necklackes, last year we've seen some brooches and finally a pearl necklace, that was a huge surprise! She used to wear her engagement and wedding rings and some bracelets long ago. She also wore a gold ring with a black opal.Oh, and a white gold or platinum diamond ring in geometrical shapes. A necklace now and then and always earrings. She hardly ever wears rings now. I don't know if you are aware there was a reason for her to stop using her engagement ring, of course, it all comes to speculation, since Felipe couldn't go and buy a ring without pretty much shouting to the world his intentions, he asked her sister, the infanta Cristina, to do that for him, in fact, it was Iñaki who made the purchase for his wife, now... guess where did that money come from? Even if Felipe later reimbursed them the money, that ring is linked to the whole scandal. No official info on that but a lot of people guessed. She rarely wears a ring now, not even her wedding band. I have often read that she finds it uncomfortable when shaking hands. Wearing engagement rings is not as traditional as in other countries; fiancees used to receive rings but also bracelets ( pulsera de pedida) or sets of rings and earrings ( my mum,for instance). Those pieces were usually reserved for special occasions,but both husbands and wives used to wear their wedding bands on their right hands. KF has worn his on his left hand ever since their wedding.